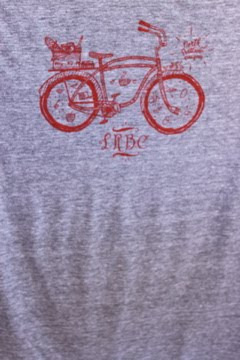 Little Red Bike Cafe: "THE T-SHIRTS ARE IN!" "The T-shirts are in! The T-shirts are in!" Yes, it's true Folks. After listening to your demands we put in an order for additional t-shirts. 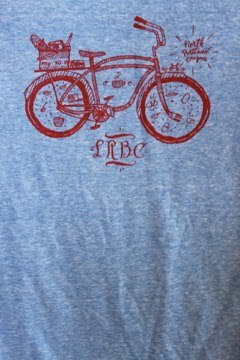 Now you can be the proud owner of a limited edition LRBC t-shirt. The shirts are printed on American Apparel's tri-blend track shirt; you know, the soft and fuzzy cotton that feels like a vintage shirt? Shirts are available in two colors: grey and athletic blue, and feature the popular bicycle design from our friend Keegan of One Foot In Front. 1. Send an email to: littleredbikecafe@gmail.com with your name, address, a phone number where you can be reached, and a description of your order (quantity, size, and color). Please put "I WANT A T-SHIRT" in the subject line of your email. 2. Upon receiving your email we will verify your order and send you a confirmation email with payment instructions. We are selling the shirts for $25 each, and each order will include a free copy of the LRBC zine, which includes photos, stories, recipes, and more ($3 value). What are you waiting for? Don't delay! Make the most of your summer by sporting a cool new t-shirt from North Portland's most beloved cafe.